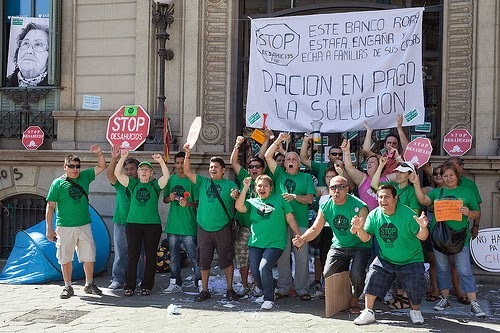 New forms of resistance in Spain: the case of the anti-eviction platform PAH! During the last two days, I have attended the conference Keys to the Crisis in Europe, organized by ATTAC Norway in Oslo. In this blog post, I will report on the presentation by a representative of the Spanish social movement PAH (Plataforma de Afectados por la Hipoteca), organizing in support of those, who are threatened with eviction from their homes, because they can no longer service their mortgages. When the global financial crisis erupted in 2008, the construction bubble in Spain burst throwing the country into deepest recession. Many people lost their jobs and, as a result, have no longer been able to service their mortgages. The overall situation is characterized on the one hand by a surplus of accommodation, which does no longer find any buyers and therefore remains empty, and many people being threatened with eviction, because they cannot pay their mortgages any more. A string of suicides by people threatened with eviction dramatically highlights the social hardship of the situation (The Huffington Post, 15/02/2013). As the representative of PAH explained at the conference, the organization supports all those, who are threatened with eviction from their homes. The key demands of PAH are two-fold: (1) an immediate stop to all evictions; and (2) the transfer of empty accommodation into social housing. The right to housing is, thus, the key focus of the movement. Since its establishment in 2009, PAH has been successful in stopping 800 evictions. Additionally, PAH has started to occupy empty buildings owned by banks to transform them into living space for people in need of accommodation. The most dramatic success of PAH is the occupation of a block of flats in Salt, near Girona. Forty three people were meant to be evicted from the building (bloc Salt), owned by the bank Sareb, on 16 October 2013. In order to prevent this eviction, around 800 activists of PAH had joined the residents and stayed in the building overnight. The following youtube clip chronicles this occupation and ends in the announcement that the European Court in Strasbourg had stopped the eviction, thus confirming the occupants’ victory. As the PAH representative outlined, the housing crisis provides a good case for mobilizing citizens more widely, because of its general impact across society. Victories in the short-term such as in Salt are essential to mobilise for wider societal transformation in the long-term. Where are the trade unions? As the PAH representative also made clear, while individual trade union members are part or supportive of PAH, both major unions themselves, the CCOO and the UGT, have not been part of this movement of resistance against the consequences of the crisis. In a way, many Spanish citizens have given up on the official trade unions as potential participants in the resistance against austerity. The situation could not be more dramatic from a labour perspective. How do these trade unions expect to fulfil their role if struggling for social justice in society, if they are not part of movements such as PAH? How can they have any legitimacy in the eyes of people, if they fail to support those in need when it counts? While PAH and its campaign provides hopeful glimpses of a future characterized by solidarity, the passive role of Spanish trade unions is a warning for the labour movement more generally: Either participate in the (class) struggles against austerity or risk to become obsolete!